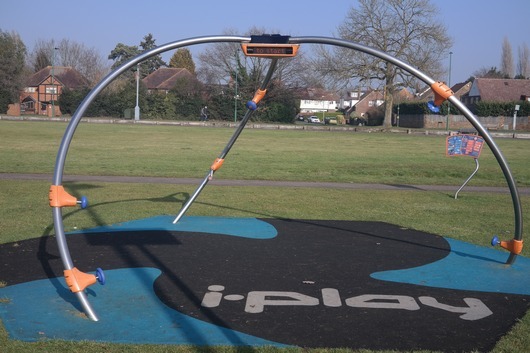 We also have just installed several new items of new play equipment in the grass area between the two areas. 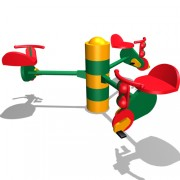 These include a large rope swing - The Viper, a carosel unit - The Titan and a grip and glide unit - the Freerider.There is also an electronic activity unit - The iplay. Come along and have fun ! 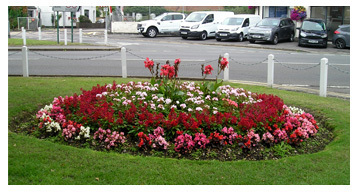 We also proposed to replace both the springers and resurface around the other roundabout. You can also talk to our groundsman who will pass your views on to us. The Council is pleased to announce the completion of its newest project the Green Gym, on Datchet Recreation Ground next to the tennis courts. 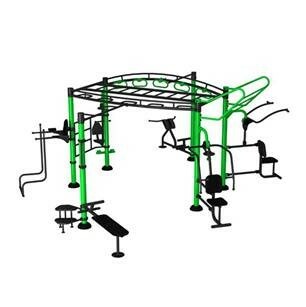 The Gym comprises of a "Big Rig" (shown below) which has 7 fixed workout stations and is suitable for 15 users at a time, along with 4 individual items of equipment, an exercise bicycle, a cross trainer, a self-weighted rower and a disabled use arm and pedal bike. All set on a rubber mulch surfacing. 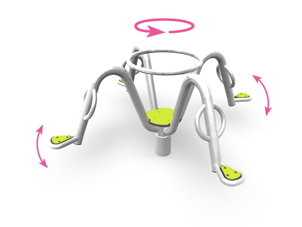 The equipment is designed for youths and adults who are over 4' 7" in height and works on body weight to build muscle and cardiovascular strength, and tone and define muscles. 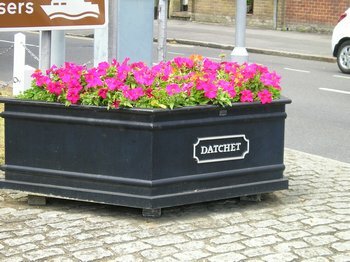 Datchet Parish Council owns and maintains much of the "open space" in the Village, such as the Recreation Ground, Village Greens, Cemetry, and the Riverbank near the Boatyard. The Cut (Horton Road), The Recreation Ground (Green Lane), The Willowfields and The Land at Mill Place (off the Recreation Ground), The Sabatini Land (Horton Road), The Riverfront (Windsor Road) and The Village Greens. The byelaws protect the grounds, the wildlife and the public and prevent unauthorised use and activities. For full details please see the Byelaws section under the heading of The Council on the top bar. We also own and lease properties which are either used or let out to third parties for the benefit of the Village. These properties include The Bridge at 24 The Green, the Village Hall, the Library and Police Point at Montagu House, the Youth Club, Cemetry Lodge and Cemetry Chapel. 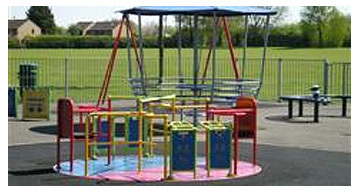 We maintain and manage the grounds and property assets, and develop new facilities, which in recent years have included the new Library, floodlighting of the ball-court, renovation of the tennis courts and children's play area, the chair store and toilets at the Village Hall, refurbishment of 24 The Green and repair of the London Road milestone. The Parish Council in partnership with The Royal Borough of Windsor and Maidenhead and The Barker Bridge House Trust have almost completed a major refurbishment project at the Riverside Gardens, on Windsor Road, Datchet. 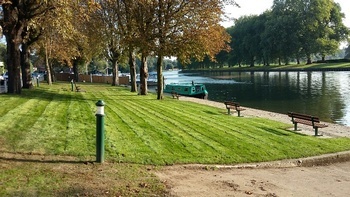 The works have included the building of a new riverside wall and footpath along the whole river frontage along with new mooring rings for visiting boats. We have refurbished all of the seats and put these on new bases and installed 3 new picnic tables. There is a new co-ordinated range of litter bins and lighting bollards and a wider access on the central path. The whole site has been regrarded and turfed. The frontage with Windsor Road has had a new bonded gravel strip installed along with new and refurbished white post and chains. We have unfortunately had to remove 2 of the older tress for health and safety reasons and will shortly be pruning the other trees to allow more light into the site to help the new turf grow. We are installing a rope and post fence to prevent the geese from grazing the new turf and have resurfaced the areas underneath the picnic benches. We will also be installing a dock ladder as a means of escape if anyone falls into the river. 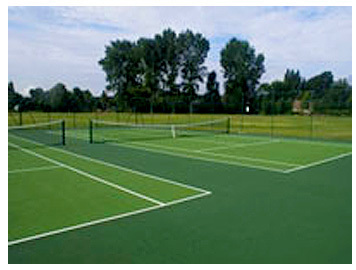 Our recently refurbished Tennis Courts area available to all, free of charge. Just turn up and Play. All we ask is that you use them with respect. 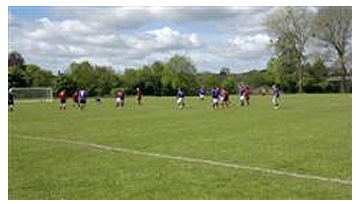 The Parish have football pitches available for seasonal and casual hire. Please contact us for booking arrangements and fees.